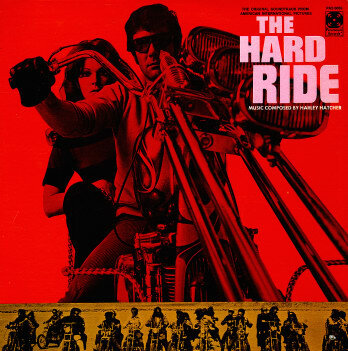 For the 450th Soundtrack of the Week we've got another collection of rock and pop songs, this time for the Vietnam vet biker movie The Hard Ride. The album starts out with a kind of poppy rendition of "Swing Low, Sweet Chariot" by Bill Medley and then goes into a nice countryish rock song, Thelma Camacho's "I Came a Long Way To Be with You". She also sings "Carry Me Home", a Motown-influenced number that isn't as affecting, though she has a great voice. "Fallin in Love with Baby" is a pretty straightforward pop rock song by Junction. From the little I've read about this movie, I gather that "Baby" is the name of the main character's motorcycle. "Fallin' in love with baby / Baby and me like to ride / Leaving the world behind / Giving me peace of mind / Keeping me satisfied." After this come three songs by Bluewater. "Another Kind of War" also directly informs the viewer of the plot, as this soldier returns from the Vietnam war only to get dragged into a biker war. The music is kind of loungey, even Musak-like. "Be Nobody's Fool" is going for more of a soulful sound and again voices the plight of the hero. Finally "Let the Music Play" brings in a country sound which sounds better for a motorcycle song. It has a Glen Campbell quality to it. Bluewater comes back later on for "Shannon's Hook Shop" which is a curious mix of Motown and hippy rock..
Bob Moline gets a pair of songs. "Where Am I Going Today" is a fairly standard early '70s pop number that might remind you of hits from the time, Charlie Rich's "The Most Beautiful Girl in the World", for example, though The Hard Ride preceded it. Moline reprises this song later, but this time it's called "Love Theme from The Hard Ride". What's been missing so far is music that sounds like it should be for a biker movie. Finally comes something that sounds more like it, two songs by The Sounds of Harley, which I'm pretty sure is a band that features the great Davie Allan on it, patron saint of biker movie soundtracks. "The Hard Ride" is a tough instrumental that's kind of a slow burn. While it doesn't drive fast it does have the right intensity. "Victorville Blues" is a favorite tune of mine. I'm pretty sure I heard it on some Davie Allan compilation. It's a slow, moody, atmospheric instrumental, closer to surf than hot rod, and just wonderful!